Let’s face it. Sometimes we realize we’re spending more money than we should be. At other times we’re forced to cut our budget due to factors outside of our control. 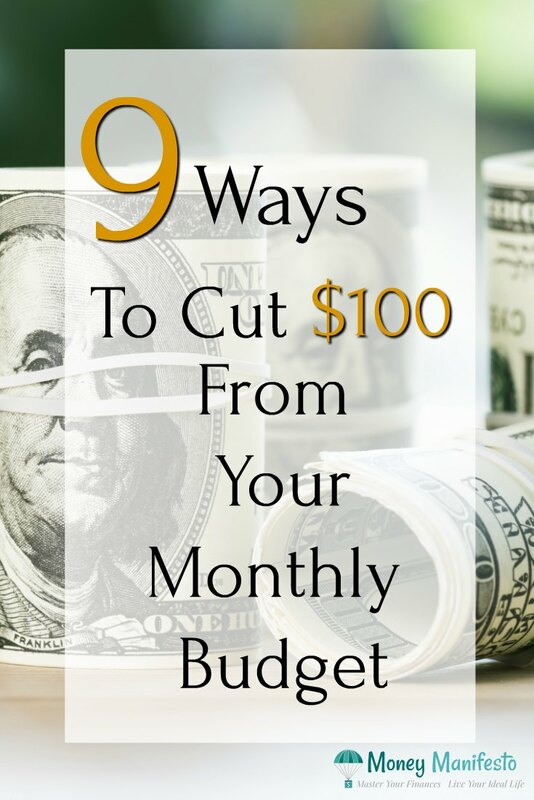 Rather than not cutting back and racking up credit card debt, I thought I’d share these 9 ways you can cut $100 from your monthly budget should you ever have to make that decision. If you’re like me, you put aside a set amount of money out of every paycheck to pay for your next vacation. Unfortunately, when money is tight, this is often one of the first things to get cut from our budget. After all, if I can’t afford my bills, what business do I have taking a vacation?! Cutting back on dining out is an easy way to save money in the short term. Cooking food at home can be much, much cheaper than paying someone else to cook food for you, serve it to you and clean up after you. If you need to find $100 a month quickly, reduce your dining out budget to save some money fast. I don’t know about you, but I have a lot of food sitting in my pantry that has been in there for a while, but is still good. Take all of that food that you never eat and make a meal plan out of it. By doing this, you can reduce your grocery spending that month while you use up all of the groceries you already have but forgot about. If you don’t have a fully stocked pantry to raid, you can still save money on your grocery bill. Simply downgrade from some of the more luxurious items you normally buy and get staples like rice and beans instead. You might be surprised at how much money you can save by eating a more simple diet for a month. Of course, you need to make sure you still buy healthy food and not junk food or else you’ll hurt your health which will cost you more in the long run. While this would be one of the last things to get cut from our budget, cutting the cable cord is a fast and effective way to save up to $100 a month when the budget is tight. Just make sure you won’t be spending more money paying to entertain yourself in other ways because the cable is no longer an entertainment option. Of course, a lot of the cable TV content can be seen online these days and a cheap Netflix subscription should be able to hold you over until you can activate your cable again. Switching cell phone providers is one of the most effective ways to consistently save $100 a month. If you have more than one cell phone line in your household, consider switching to a company like Republic Wireless that gives you unlimited calls, texts and data for just $25 a month. Alternatively, you could switch to Ting that only charges you for the minutes, text and data you actually use. After you pay off your car loan, you can easily save well over $100 a month by continuing to drive your car rather than going out and buying a new car as soon as you pay off your loan. In fact, check out this post that describes exactly how you can use this tip to never have a car payment again. While cutting money from your budget is one option, earning more money will provide the same effect. Just remember when you earn more money you actually need to earn more than $100 to account for the taxes you will have to pay on the additional earnings. Picking up an extra shift or a part time job could easily earn you the money you would need to add $100 a month to your budget. Selling things around your house that you no longer need or use is another great way to make a quick $100. A couple of big items or many small items could easily add up to $100. Better yet, have a garage sale and clear out a ton of space and earn money at the same time. Hopefully you found at least one or two things on this list that will help you cut $100 from your budget when you need a quick fix. However, I’m always curious to hear what you would do to cut $100 from your budget. Let me know in the comments below! I look for something new to cut out of my monthly budget every two months. That way I can look back at the previous two months and see how I have been doing. In this situation, I am mostly giving up smaller things, but it adds up! Being vigilant about finances should be a practice for everyone. List down all expenses and decide which ones you can cut out, and the money you save can be earmarked for other (higher) priorities. It really should but sadly isn’t for many people. There are always ways to cut down your expenses even if you have to make the hard choices. My Walmart Family Mobile plan costs only $72.85 for two phones, voice text and data and 4G. I see many people that pay much more than that for one phone. If you are hourly, often there is a way to put in an extra hour or two a day to make a lot more too. Gas coupons save me a lot of money, .10 off, on double coupon days makes a big difference. I don’t think you should take a vacation unless all your bills are paid for a extra month. I know it takes that long to financially get caught up after the vacation.